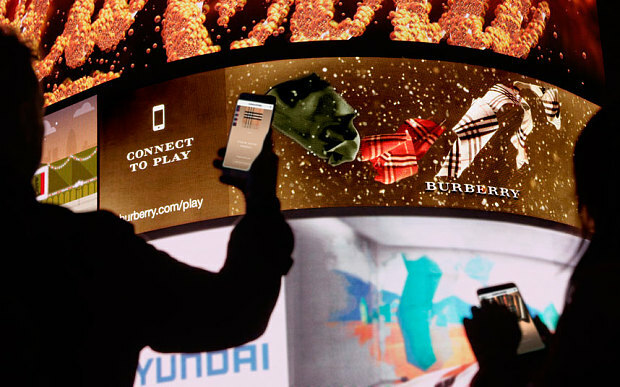 Burberry uses DreamWorks Animation movie technology to beam personalised scarves onto Piccadilly’s curved screens. Burberry is taking over the world famous Piccadilly Circus curved screen with an interactive campaign that usesthe same technology featured in the 3D film Kung Fu Panda. The British fashion business has partnered with DreamWorks Animation to create an advert that uses the movie studio’s NOVA technology to allow passersby to design their own personalised Burberry scarf. Christopher Bailey, chief executive of Burberry, said: “The huge screens in Piccadilly Circus give us a great canvas to launch the technology in a space that will show the possibilities of what this technology can do in an entertaining and engaging way. Giving users the ability to control their movement in various ways makes the experience much more personal when viewed on a screen whether at home or on a digital billboard. “We partner closely with many social media platforms around the world such as Twitter, Facebook, Line and most recently Snapchat because they allow us to develop a much more intimate relationship with our customers. Visitors to the London landmark will be able to use their mobile phones to design their own heritage Burberry scarves with their initials, which will then be beamed onto the giant screen. They will then be able to buy their personalised scarf online or from Burberry’s flagship store on Regent Street. “Burberry is a world leader in luxury, and, leveraging NOVA’s technology, we’re thrilled to help them demonstrate a new and innovative product experience that enables consumers to both personalize and visualize the iconic Burberry scarf”, said Jeffrey Katzenberg, chif executive of DreamWorks Animation. It is the latest move by the luxury fashion house to appeal to technology savvy shoppers. It has also developed a photo booth with Google that allows shoppers to star alongside Elton John and Rosie Huntington Whiteley in its Christmas adverts. The luxury group has also launched its own music Youtube site, Burberry Acoustic, featuring up and coming British singers including James Bay and Mercury music prize winner Benjamin Clementine, performing acoustic sets. The group also has its own Snapchat and Instagram accounts and was the first brand to livestream its show on Japanese messaging platform Line.